A major EMP disaster has just struck. With the grid down, the masses are left without a way to resupply their food, no running water, and in a state of panic. 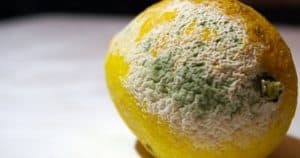 Let’s hope that a situation like this never happens to you (though the people of Bosnia, Syria, Georgia, Somalia and so forth will quickly tell you how quickly things can go from “normal” to SHTF). But, if the S really does HTF, your standard first aid kit meant to treat scrapes and scratches is NOT going to cut it! This is where an IFAK comes in to play. IFAK stands for Individual First Aid Kit and they are issued by the military to soldiers going into battle. 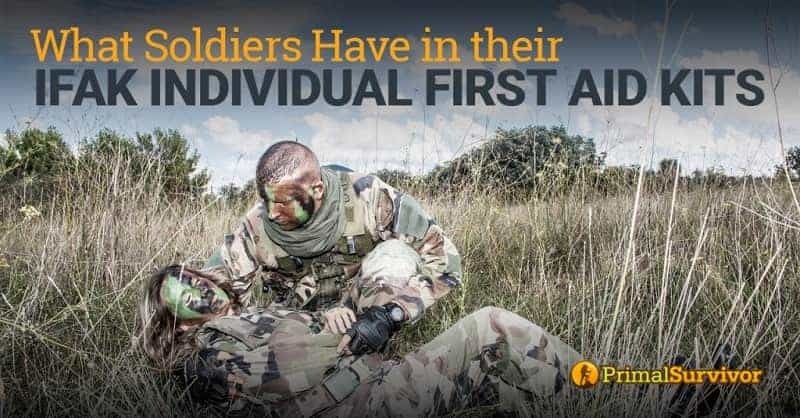 Even though the IFAK contents vary depending on the branch of military (Army, Marine Corp, US Air Force…) and also where the soldier is being deployed (Iraq, Afghanistan…), they all cover the same most common deadly injuries. Want an Emergency First Aid Supplies Checklist? Click the image to get a printable version sent to you. In the past few years, it has somehow become cool to wear a bunch of camo, buy Army surplus gear, and flaunt it around to show what a [email protected]$$ you are. Let’s be clear here: There is nothing “cool” about carrying an IFAK around with you. Unless we are talking about how “cool” it is to be responsible. An IFAK is going to be completely useless for more than 99% of what people mostly have to deal with. An IFAK is not going to treat a boo boo. An IFAK won’t help your migraine go away. When might you need to worry about Deadly Hemorrhaging or Inadequate Airway? Here’s just a few that I can think of off the top of my head. 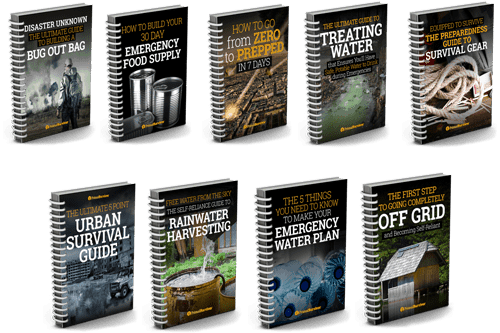 If you simply want to be prepared for whatever disaster may come! The Army, Marines, and Air Force all issue IFAK, and the contents are different in each. The Army has also updated its IFAK kits a couple times. Military from other countries also issue IFAK kits too, and those IFAK contents might not match what the USA gives out. Here’s what the latest versions of the Army, Air Force, and Marine Corp IFAK contents are. 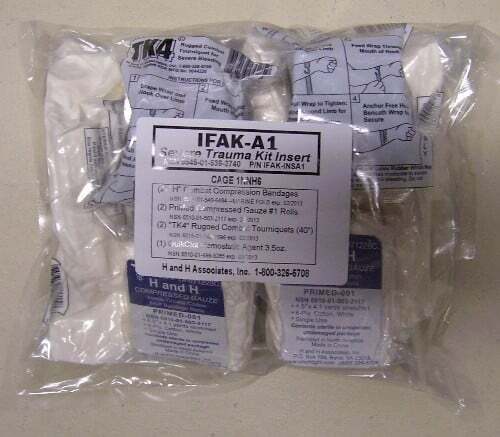 In the case of the US Army, “IFAK” stands for “Improved First Aid Kit.” That Improved FAK was issued in 2006. In 2014, the Army updated it to the IFAK II by adding several more items. Six Inch Israeli Pressure Bandage: The bandage acts as many types of bandages in one. It has a sterile, non-adhesive pad that can act as a primary dressing. It can be easily wrapped, so acts as a secondary dressing. It is elastic, which means that it applies pressure and acts like a tourniquet over the wound site. The easy closure means it can be used very quickly for situations where “every second counts” and can even be applied by the victim with just one hand. Gauze Bandage: Gauze bandage is used to dress wounds in the field. 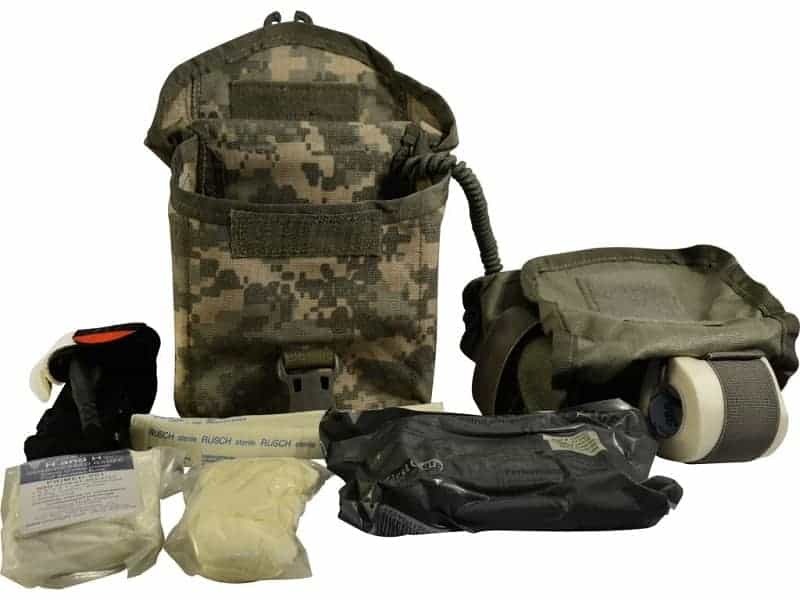 The Improved Army First Aid Kit II includes a 100 count of 4 ½ inch gauze bandages. Surgical Tape: The IFAK surgical tape is 3 inches wide and comes in a 10 yard roll. It is used to apply dressings over the skin. Gloves: Wear gloves when treating injuries to reduce risk of infection. QuikClot Combat Gauze: Contains a hemostatic agent which stops blood loss quickly. Put the gauze directly over the wound and apply pressure. Should You Buy an IFAK? You can buy military IFAK kits online at a lot of stores. Be warned that they are fairly pricey (sometimes over $100). The contents might also be EXPIRED! Rather than wasting your money on a pricy IFAK kit just because it happens to be the same one issued by the military, why not just build your own? 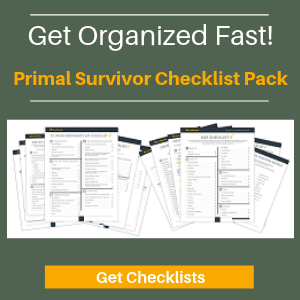 You’ll have a lot more room to add the items you really need for everyday injuries and disasters so you’ll be prepared for everything and not just the worst case scenarios. 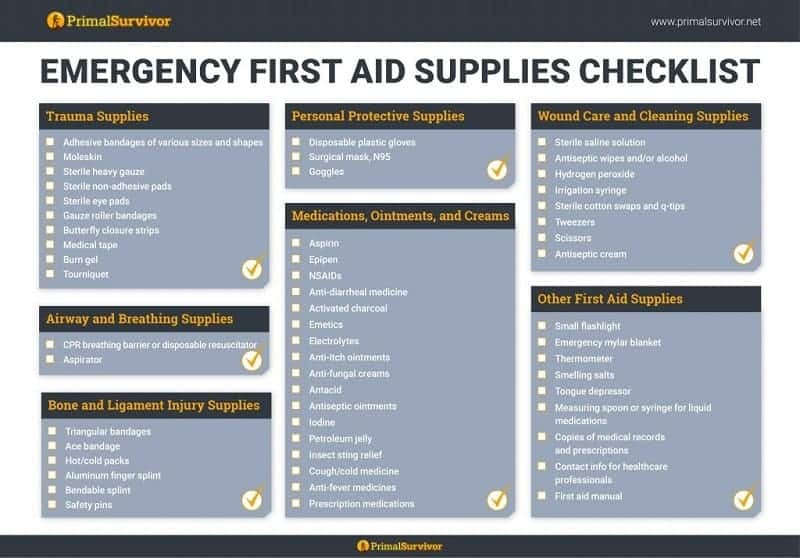 Here’s a complete first aid checklist for your home, a smaller wilderness first aid kit checklist, and a Bug Out Bag first aid checklist. But that’s just my take on it. What do you think about buying Military IFAK kits? 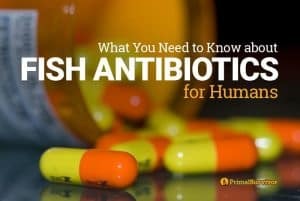 This is the most comprehensive and helpful article I’ve ever read on the subject. I’m almost completely clueless when it comes to this subject matter and it is beyond helpful. The links to amazon for purchases make is (almost too) easy. Thanks so much. If you’ve never used some, or all, of the IFAK supplies I *strongly* suggest you buy an extra one or two pieces of the primary components. Open the package, read the directions, handle the product, read up on how to use it, watch some You Tube videos, etc. IOW, acquaint yourself and others with the product *before* you have to use it IRL. Great point TX. I think we are all guilty of not testing our gear and practicing our skills BEFORE they are needed. TX is totally correct! Practice, practice, practice using bandages, etc. to build the muscle memory for when supplies are needed. Also one may purchase military Field Manuals to learn proper application of med supplies. Most FM’s are repetitive, there’s a reason…to retain the information. Most importantly practice using as well as mental preparedness. Things can get messy quickly. 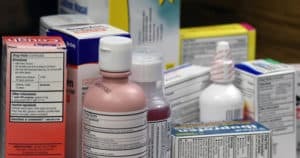 The list early in the article will treat boo-boos (bandaids & neosporin), vascular headaches (NSAIDS — I pack both naproxen sodium and ibuprofen), and the moleskin will protect your feet from blisters. It’ll treat major wounds, too. Great list! I get sprains more frequently than average, so an ACE bandage — 4″ wide that can do double duty with knees or, doubled over, with ankles — and a pump up walking ankle splint brace (they prevent lateral movement that exacerbates the sprain while allowing for supported walking that encourages healthy blood flow and healing) are a must for me. I can, with enough product, tape it in a pinch but these two products are useful enough to more than justify their weight and packing space. Good additions for sure. Thanks for stopping by Marla. Great info – thanks! I would also suggest that you take a first aid course from a reputable source so that you understand when and how to use the IFAK. The Good Samaritan Law will protect you, but only to a point. When it truly counts, you should not be experimenting or guessing. Keep a kit in easy-to-access places like your home, car, office, RV, and others. 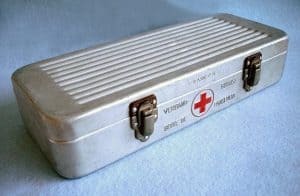 Where feasible, add a full trauma kit to help increase that “golden window” between injury and professional help. Just my two cents. Be safe!